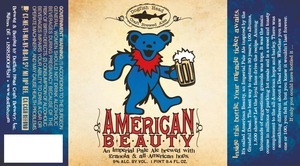 Dogfish Head Craft Brewery, Dogfish Head Craft Brewery, Inc.
Dogfish Head Craft Brewery, Inc. American Beauty is brewed by Dogfish Head Craft Brewery, Dogfish Head Craft Brewery, Inc.. The alcohol content is 9%. This brew is poured from a bottle or can. We first spotted this label on May 26, 2013.